With support from the University of Iowa and the Office of Naval Research. 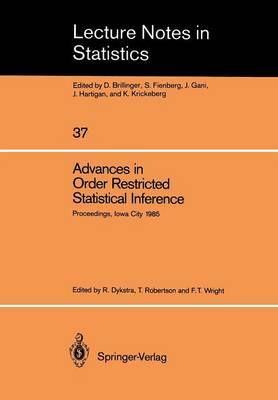 a small conference on order restricted inference was held at the University of Iowa in Iowa City in April of 1981. There were twenty-one participants. mostly from the midwest. and eleven talks were presented. A highlight of the conference was a talk by D. J. Bartholomew on. "Reflections on the past and thoughts about the future. " The conference was especially valuable because it brought together researchers who were thinking about related problems. A small conference on a limited topic is one of the best ways to stimulate research and facilitate collaboration. Because of the success of the first conference. a second conference was organized and held in September of 1985. This second conference was made possible again by support from the Office of Naval Research under Department of the Navy Contract NOOOI4-85-0161 and the University of Iowa. There were thirty-five participants and twenty presentations on a wide variety of topics dealing with order restricted inference at the second conference. This volume is a collection of fourteen of those presentations. By collecting together and organizing the fundamental results in order restricted inference in Statistical Inference under Order Restrictions. R. E. Barlow. D. J. Bartholomew. J. M. Bremner and H. D. Brunk have done much to stimulate research in this area. and so we wish to express our gratitude to them first.